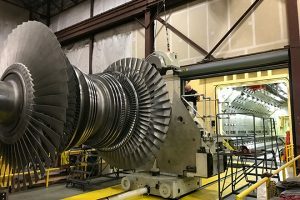 Mechanical Dynamics & Analysis was contracted to straighten and machine a double flow low pressure (DFLP) rotor from a 3,600 rpm, 103 MW combined cycle power generating unit. The rotor forging arrived with both shaft ends bent. The Turbine end shaft end was bent and found to have a 0.007” total indicator runout (TIR) at the coupling outer diameter. The generator end shaft end was bent and found to have a 0.053” TIR at the coupling outer diameter. MD&A was able to straighten both shaft ends to within 0.0015” TIR using a combination of thermal and machining straightening processes. Then, MD&A completed the final high-speed balance and final machining of the shroud covers. The rotor thermal straightening process included an initial rotor stress relief and multiple thermal straightening iterations. 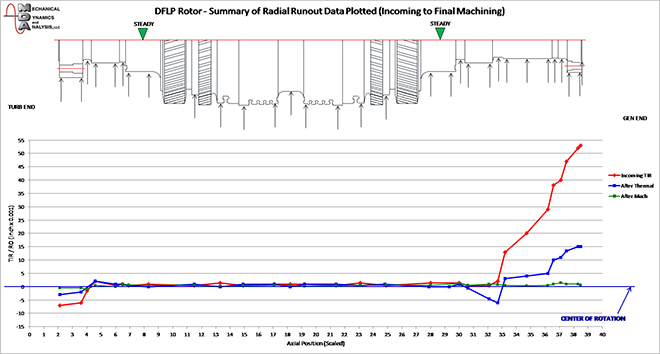 MD&A expert technicians performed detailed visual, dimensional, and non-destructive examination (NDE) of the rotor forging before and after each thermal process to confirm that no issues were present. Rotor NDE inspections consisted of both hardness testing and wet fluorescent magnetic particle testing. Based on the amount of shaft end distortion and the experience and expertise of MD&A technicians, it was recommended carrying out an initial stress relief of the rotor and additional thermal straightening iterations of the shaft ends to further reduce the shaft end runouts. 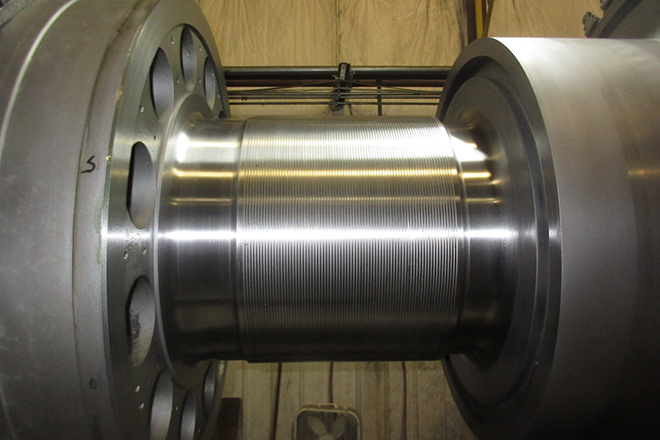 The initial stress relief of the rotor forging was performed on both shaft ends to relieve any internal stresses and determine the final relieved state of the shaft end runouts. This involved removing all installed blades and seal strips, stress relieving the rotor, blast cleaning, NDE, hardness checks, and runout checks along the length of the rotor. Additional thermal straightening iterations were also performed on the generator end of the shaft to further reduce the amount of runout. 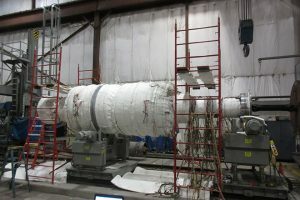 This involved thermally moving the shaft end, stress relieving the rotor, blast cleaning, NDE, hardness checks, and runout checks along the length of the rotor. Due to the high temperatures of both couplings during the stress relief processes, a vertical stress relief was not possible. As a result, the stress reliefs were performed in the horizontal orientation while rotating the rotor periodically 180° during the heating process so as not to set a thermal bow into the rotor. Based on results of the thermal straightening iterations, machining straightening of both shafts was performed. The work involved final straightening machining of both shaft ends and final dimensional, NDE, and runout checks along the length of the rotor. The thermal straightening operations reduced the Turb End shaft end TIR from 0.007” at incoming to 0.003” after completion. The Turb End shaft end straightening machining included final machining of the steam gland diameter, all steam gland seal grooves, all transition radii, and the coupling to remove any remaining runout. The thermal straightening operations reduced the Gen End shaft end TIR from 0.053” at incoming to 0.015” after completion. The Gen End shaft end straightening machining included final machining of the journal, oil deflector, steam gland diameter, all steam gland seal grooves, all transition radii, and the coupling to remove any remaining runout. Also, the coupling holes were line bored to set the bolt circle pattern back on center. In parallel to the blading and seal strip installation, MD&A produced a new stub shaft in support of performing the high-speed balance. The balance work involved installation and aligning the new stub shaft, installation of the rotor in the high speed balance facility, balancing the rotor at operating speed, and performing an overspeed test of the rotor. The rotor work was completed on schedule and returned to the owner. For every repair job, large or small, the speed and effectiveness of our response team is matched only by the depth and breadth of our engineering expertise. Have us look at your bowed rotor today. 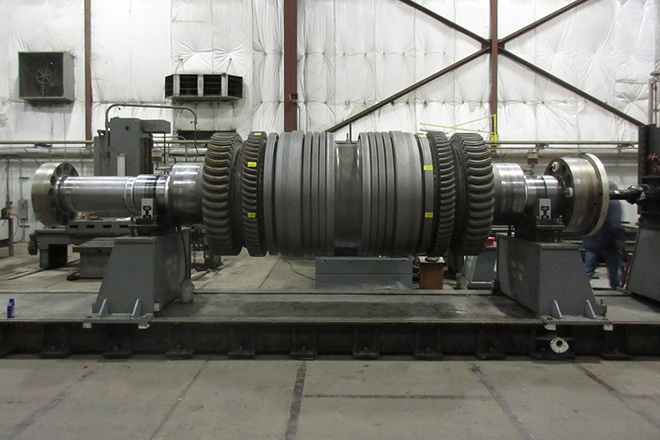 Call our Turbine-Generator Repair Facility at (314) 880-3000 or use our Contact form.